The constellation "Little Dog" is quite unobtrusive and to help you find it, look for its "shoulder star", "Betelgeuse" of the constellation Orion. The constellation "Little Dog" is one of the 48 which Ptolemy described in early Greek astronomy. In ancient Greek the name of the main star "Procyon" means "before the dog". This is an indication that the Procyon called it the "Dog Star". The constellation "Little Dog" is an unexceptional and small constellation. The observer finds it south of the constellation "Twins". Apart from the inner part of the Antarctica, the "Little Dog" is visible all year round from the entire world. In Greek mythology, Dionysus is the god of intoxication, and taught the farmers Icarius how to press grapes. Icarius offered the same to the shepherds that enjoyed plenty of it. In their rush they thought Icarius had poisoned them and so they had to kill him. Erigone, the daughter of Icarius, searched for her father with her little dog. The shepherds were punished and the "Little Dog" got his pride of place in the firmament. 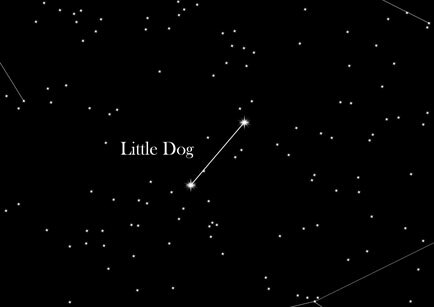 In another version of the origin of the constellation "Little Dog" is the doggy companion of the hunter Orion.